Positioned in distant southern climes, far from the perceived centres of human civilisation – the thin coastal belt, broad plains and scorched deserts of Australia offer an enticing laboratory for the sciences of experimentation and herd manipulation. Wrenched from the hands of its native population through a bloody series of wars and oppression, the modern nation of Australia was established as a British penal colony in 1788. Doubtlessly much has changed and developed since then, but still it’s difficult to shake the image of Australia as contiguous and eternal penal colony. Since federation in 1901, examples of Australia as anything but felicitous imperial servant are few and far between. The nation cheerfully delivered its young to be blood sacrifices in the imperial territorial jousts of the twentieth century and various Anglo-American imperial intrigues throughout the latter twentieth century and early twenty-first. Beginning in the 1950s, Australia had the dubious pleasure of being Great Britain’s nuclear sandpit. All manner of outrageous and unforgivable atomic ‘experiments’ were conducted across West and South Australia, as unrelenting clouds of nuclear fallout drifted over the largest populations centres on the eastern Australian seaboard (the effects of which were covertly studied by the ‘mother country’ for decades thereafter). Like a serially abused child, this nation of ‘Larrikins’ and ‘Eureka Rebels’ barely raised a mute whimper. Among a mere handful of momentary blips (on an otherwise placid radar), one may have been the 1972 Whitlam government’s tepid resistance to the enormous, malevolent and largely secret US military base network that speckles the Australian landscape (like the first signs of approaching disease). Whitlam and his unruly gang were swiftly dispatched in a bloodless coup, and no Australian politician of note has dared rock the boat since. Another lonely blip may have been the 1985 ‘Australia Card’ – a national identity card that would have linked and collated personal information and mandatory identifying biometrics. A brazen totalitarian gesture (with a patriotic ‘green and gold’ branding and dazzling press launch), the confused populace felt a bovine unease around the proposal and, lest it spook the cattle, the card stumbled onto a slow oblivion two years later. Interestingly, every salient objective of the ‘Australia Card’ has since come to pass through one gladly received ‘initiative/convenience’ or another (many subsumed by the Medicare Card and Centrelink). While certainly queasily deferential to authority, perhaps the most instructional recent historical trait in the Australian experience has been that half-hearted rejection of the ‘Australia Card’ – a proposal so clumsily introduced as to resemble a deliberate provocation, designed to test the waters (and ultimately perhaps to fail – so as to set a line in the sand, demarcating exactly how far the gullible can ultimately be stretched). Australia is also a popular testing ground for corporate and consumer technologies. Politely referred to in marketing literature as “early adopters,” most Australians are guileless and enthusiastic proponents of convenient (but potentially sinister) technological innovations. From ATMs, EFTPOS payment systems and microchipped credit cards to mobile phones and wireless networks, Australia has reliably led the world in trialling and adopting these peerless developments in consumer profiling and data capture. Mastercard, Visa, Vodaphone and numerous other corporate behemoths consistently utilise Australia to trial new technologies and techniques. 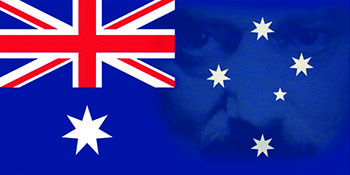 Unsurprisingly, Australia was an early and enthusiastic member of the Five-Eyes-Network, a globe-straddling post-WWII domestic and international surveillance co-operative that deployed nascent technologies (like ‘Echelon’) to monitor all electronic communications while ostensibly outsourcing the bulk of domestic spying to international partners (thus lending a [largely unnecessary] air of plausible deniability lest accidental public or journalistic exposure occur). Unmistakably fashioned around the twin primary aims of curbing domestic dissent and international commercial espionage, the Five-Eyes-Network would haughtily justify its existence – on the exceedingly rare occasion it had to – with a casual application of Bogey-Man-Of-The-Week™ lotion (Communism®, Terrorism® or whatnot). As befits a ‘former’ penal colony, Australia is over-governed and over-regulated (ironically, even a recent government audit decried the overwhelming saturation of legislation and registration). Australian adults are infantilised to the point where they are apparently untrustworthy enough to drink in public places, are sanctioned for riding pushbikes through public parks and must be locked into nightclubs during prescribed ‘volatile’ hours. Supposed private property is regulated behind a wall of incomprehensible bureaucracy, and membership of perfectly legal (but government proscribed) organisations becomes instantly and unquestionably illegal. Physical space in Australia is entirely over-regulated and captured, a timid populace cowered by an unrestrained police force (now empowered to force random fingerprinting), an unchallenged legislature (the Northern Territory has begun ‘paperless’ and therefore incontestable arrests), invincible intelligence agencies (endowed with gargantuan budgets and unaccountable powers) and unassailable rampant corporations. When it comes to the mental, political, philosophical and psychic landscape – things are even worse. Public discourse in Australia is incredibly narrow, bewilderingly staid, tediously predictable and heavily media-sedated. It’s essentially impossible to hear a publicly expressed homegrown opinion outside of the stultifying confines of mainstream ‘debate’. Some cleave to the ersatz alternatives of the ABC and SBS (both government funded) where a rigidly controlled and astoundingly toothless ‘opposition’ simply refines the mainstream dialogue through the lens of bourgeois political correctness. Examples are innumerable, but developments in recent memory will suffice. Tabloid flagship of the Police State, Melbourne’s Herald Sun, has for many years been a hysterical advocate for the Western imperial adventure branded as the ‘War On Terror’. Megaphoning a procession of serially unsubstantiated jingoisms (probably directly minted from Australia’s historically sinister intelligence agencies), headlines like “Beheading Plot Smashed,” “Evil Within,” “Thirty Jihadis Return Home” and “Lessons In How To Spot A Jihadi” are loud on volume, long on anonymous ‘official sources’ and forever short on facts. A massive police and security agency ‘anti-terror’ operation on 17 September 2014 (involving over 800 police officers, helicopters, bomb sniffing dogs etc. etc.) produced exactly two charges (both of tenuous value) and a firestorm of unquestioning, fevered media coverage (all photos, video and information helpfully supplied by the Australian Federal Police Media Liaison Unit). In Australia, ‘reporters’ no longer ‘report’, they simply cut and paste official media releases. With a handful of further ‘terrorist threats’, ‘incidents’ and ‘sieges’ successfully completed, and the herd now appropriately fearful, the then Abbott government introduced a raft of outrageous ‘national security’ laws – each a mortal assault on the limited range of ‘freedoms’ Australians already ‘enjoyed’. Perhaps the most onerous of the morbid bunch was a series of laws known as the ‘mandatory data retention laws’. These provisions stealthily legalised and normalised mass surveillance of the entire (and entirely) clueless Australian population. Not one officially sanctioned pundit bothered to mention that the laws are possibly in breach of at least three articles of the Universal Declaration Of Human Rights and commit Australia to being an official Police State. So Machiavellian is the sunburnt landscape, that droves of Australians casually promulgate and disseminate unhinged anti-Islamic diatribes and disinformation – fearful of a chimeric yet apparently approaching ‘Sharia Law’ and ‘Halal’ dictatorship. Egged on by shock-jocks and other media Svengali, the herd quiver at the sight of Mosques, hoax pederastic ‘mass-weddings’ and ‘alien’ attire. It would be laughable were it not so ugly. Manipulated, like so many head of cattle, by their media, corporate and government masters, Australians have allowed Islam to become the lightning rod for all their fears, prejudices and hatreds – a hoary old trick of tyrants – but forever a successful one to legitimise wars and domestic control. Philosophically and psychically manipulated against all their own best interests, Australians are simply unable to think, express themselves or even comprehend outside of the narrow officially designated allowable thought corridor. If ever Australians needed a reminder that they labour under government by goon squad, they surely received it on 28 August 2015 when the ‘Australian Border Force’ warned they would be randomly checking people’s papers on the streets of Melbourne. The action was eventually cancelled in a snowstorm of farce, but the fact that it was even considered (and announced) speaks troubling volumes to the decayed corpse of Australian ‘freedom’. Docile, compliant and forever fawningly agreeable to its imperial and domestic ‘betters’, the Australian population is often incapable of even the most feeble acts of mental self-defence. Unconscious to the point of comatose, the ‘body politic’ knows nothing, couldn’t care less and drives blind – headlong into an unforgiving future. A slave-nation of idiot infants bewitched by shock-jock tirades and pop-culture baubles, unable to discern the psychic plantation walls that dwarf and surround it. Twenty-four million lost souls trapped in the penal mind, prisoners of push-polling, perfidious punditry and permanent war-footing propaganda. This article was published in New Dawn 153.